If you've been a blues or traditional jazz fan in the Cleveland area during the past thirty years or so, you'll probably recognize Mike Sands. The back-bone of the Mr. 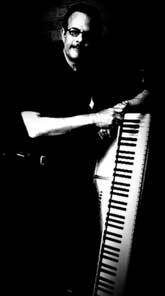 Stress Blues Band for many years, Mike, known as "The Professor", now brings his solid, traditionally based piano playing to the Blue Lunch band. His Contributions and fresh sound is displayed on our latest release "Big Sound Blues".